My husband makes fun of me because I can’t see someone crying without crying myself. It doesn’t matter what the circumstances behind the tears may be (melodrama on reality television gets every time). Suffice it to say: I am an empathizer. 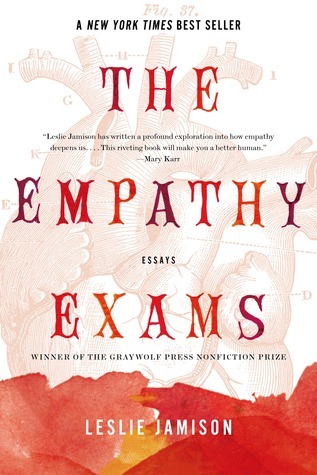 So, it should come as no surprise that I was intrigued by Leslie Jamison’s award-winning collection of essays, The Empathy Exams. The collection poses questions about empathy and how we empathize: “How should we care about each other? How can we feel another’s pain, especially when pain can be assumed, distorted, or performed? Is empathy a tool by which to test or even grade each other?” Some of the essays encourage the reader to empathize with others (prisoners, sufferers of disease). Others beg the reader to empathize with the author herself. Jamison Essays. These essays are about Jamison herself, her pain, her hardship, her struggles, and they are (not surprisingly) the worst. They are annoying, self-indulgent, and self-important personal essays. Please, they beg you, understand my pain! And to that, I say, no, thank you. Concept Pieces. These are all based upon and wrapped up in an idea or device, which tends to be more interesting than the essay itself. That is to say, the concept is usually fun, but the execution is off-putting or forced. To make matters worse, the concept pieces are often also Jamison-centric (the devices are just sleight-of-hand to make you think she’s not being completely self-important yet again). Topic Pieces. These essays are observation pieces about a fascinating group of individuals. This is where Jamison shines. If the entire collection had been made up of topic pieces, it would have been EXCELLENT. Sadly, these essays account for less than a third of the book. “The Empathy Exams” (3/5): This essay started out strong, and I wanted to like it, but it devolved into a Jamison Essay. Part of the essay is about her job as a medical actor. She plays a patient with scripted symptoms, and med students evaluate her. She then rates them on, among other criteria, their ability to empathize with her as a patient. This was the good part. The bad part is when she talks about her life as an actual patient (she has an abortion, she has heart surgery), and her actual doctors’ abilities (or lack thereof) to empathize with her. She comes off as unlikeable and needy and annoying. If the essay had focused merely on her work as a medical actor, it would have been much stronger. “Devil’s Bait” (4/5): This is, by far, one of the strongest essays in the collection and falls squarely in the Topic Pieces category. The essay is about people afflicted with the mysterious Morgellons disease (“In short, people were finding unidentifiable matter coming out of their bodies. Not just fibers but fuzz, specks, and crystals. They didn’t know what this matter was, or where it came from, or why it was there, but they knew—and this was what mattered, the important word—that it was ”). The CDC released a report in 2012 about the disease that was inconclusive (Is it a real syndrome? Or is it delusional parasitosis?). The report was sectioned as follows: Introduction, Methods, Results, Discussion, Acknowledgements, and this essay mimics those sections. The majority of the essay is spent discussing Morgellons sufferers, whom Jamison meets at a convention in Austin. Her thesis is this: Whether the disease is “real” or imagined (and Jamison makes clear that she thinks it is imagined), these people are truly suffering, and for that, don’t they deserve compassion? “La Frontera” (1.5/5): I think I rated this so low in part because it was such a disappointment after “Devil’s Bait.” Jamison goes to an encuentro (a literary conference of sorts) in Mexico. There’s some stuff about narco wars, some stuff about border crossings, some stuff about visas, some stuff about Flarf. This essay isn’t as tightly constructed as her others, doesn’t fit well with the rest of the collection, and is not as powerful as Jamison intends. “Morphology of a Hit” (2/5): This is the worst of two worlds: a Jamison Essay masquerading as a Concept Piece. Jamison uses Vladamir Propp’s Morphology of the Folktale (“a map for storytelling, a catalog of plot pieces arranged into thirty-one functions: commencements, betrayals, resolutions”) to tell her awful tale of getting assaulted (punched in the face, nose broken) and mugged on the streets of Nicaragua. It comes off as gimmicky and self-important as it sounds. It is nearly impossible to empathize with her. “Pain Tours (I)” (3.5/5): This is broken into three sections: 1) a visit to deep, dark, and depressing mines in Potosí, Bolivia (at an elevation of 4,061 meters, it’s the highest city in the world); 2) touring people’s pain by watching Intervention, the reality TV show; and 3) taking a “Gang Tour” through South Central L.A. The idea here is good (three interesting, related but different tours), but it is short and underdeveloped. “The Immortal Horizon” (4/5): This is the other really strong essay in the collection. It’s about the Barkley Marathons, a 100+-mile race in the Tennessee Wilderness (dubbed “The Race That Eats Its Young”), founded by a man who calls himself Lazarus Lake. At the time Jamison goes to observe the race (because her brother, Julian, is one of the only thirty-five race participants), only eight men have ever finished it. It’s a weird cultish activity. This isn’t the Boston Marathon; there are no published entry requirements (“Admissions are decided by Laz’s personal discretion, and his application isn’t exactly standard, with questions like “What is your favorite parasite?” and a required essay with the subject: “Why I Should Be Allowed to Run the Barkley.”). The racers are a little nuts, and they are the focus of this essay. “In Defense of Saccharin(e)” (2/5): Another messy Concept Piece. As the title implies, Jamison is comparing saccharine and saccharin—like the false sweetener, sentimentality is fakely sweet. Thematically, she is trying to find what distinguishes pathos from melodrama. “Fog Court” (3.5/5): This is another decent Topic Piece. One of the Barkley Marathon racers is now in federal prison, and Jamison has been in touch with him via letters. This piece is about her visit to see him in prison. “Pain Tours (II)” (2.5/5): Three more of the same, but these aren’t as well constructed around the theme. The first, and best, is about Frida Kahlo (seeing pain and life in colors). The second is about Joan Didion’s Salvador (specifically an early scene in a mall) and how that relates to Jamison’s experience in a Bolivian grocery store. The third is about James Agee’s Let Us All Praise Famous Men and talks about empathy as “contagion” (“Agee catches it and passes it to us.”). “Lost Boys” (3.5/5): The Lost Boys are the West Memphis Three, three teenage boys who were convicted of the murders of three eight-year-old boys in 1994 and sentenced to life. In 2010, new forensic evidence surfaced, the Lost Boys entered Alford pleas, and they were released. Interestingly, this essay is not about the case itself but about the trio of documentaries made about the case (and how those documentaries shaped Jamison’s emotions about the people involved in the case—particularly the victims’ families and the accused). “Grand Unified Theory of Female Pain” (2/5): Some people might enjoy this essay, but I did not. As the title suggests, it’s about female suffering (she uses various examples from literature and pop culture), and a woman’s right and need to talk about that pain (“Relying too much on the image of the wounded woman is reductive, but so is rejecting it—being unwilling to look at the varieties of need and suffering that yield it. We don’t want to be wounds . . . but we should be allowed to have them, to speak about having them, to be something more than just another girl who has one.”). Jamison uses this as an outlet to talk about her cutting, her eating disorder, her mugging, her abortion. And it all feels very, well, reductive, self-gratifying, and annoying. This essay made me think that Jamison and I would not get along very well. Who should read it: The two stories worth reading, “Devil’s Bait,” and “The Immortal Horizon,” were both previously published and are available online. You can (and I encourage you to) read “Devil’s Bait” here and “The Immortal Horizon” here. Unless you really have a hankering to read all about Jamison’s personal woes, you should feel free to skip the rest. This entry was posted in Rating: 2.5/5 and tagged Book review, Book Reviews, Books, Leslie Jamison, Non-fiction, The Empathy Exams. Bookmark the permalink.